The path.points() method returns a list containing amount points along the path. 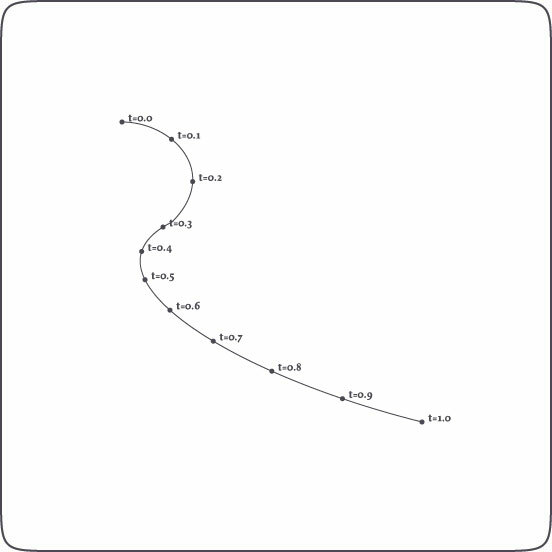 In the same way the path.point() method returns a single point at t, which is a number between 0.0 and 1.0 representing the time on the path. The path.addpoint() inserts a new point at t on the path. path.length: returns the total length of the path. 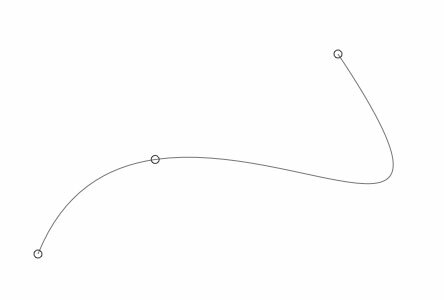 path.contours: a list of separate contours in the path (these are paths as well). These speed-optimized commands are extremely useful when calculating orbits of animated elements moving down an invisible path in an animation, when creating custom type like the LetterKnitter, when growing grass on shapes, and so on and so on. A special thanks goes to professor F. De Smedt at the Free University of Brussels for his integration and interpolation algorithms (also check the de Casteljau's algorithm). The example above is an illustration of how points on a path can be found with t (a number between 0.0 and 1.0), which represents time on the path. When t is 0.5, this means halfway the path. 0.0 is the origin of the path, 1.0 the end. It's easy to create path filters this way (in analogy to image filters). Here are some good examples. A path is basically made up of segments: two points and the curve in between. A group of segments that has a beginning and an ending, or is closed, is a contour. Character glyphs are a composite of contours (for example: the inner and outer oval of the character "o" are two contours). In typography it's often useful to get the separate contours.